From Couch to Ironwoman: Which Would You Do? Before I get to the good stuff in this post, last night Mike and I didn't run. I can't wait to get back on a training schedule so that I can get excited about crossing training runs off! We ran tonight, though, and got three more miles under our belts before the Stockade-athon 15K this Sunday. I'm not really sure what to expect out of this race considering I haven't run as much as I was before our half marathon due to my overuse injury. I may still come up with some goals, but keep in mind that all I really want to do is cross the finish line without stopping or walking. Now that we have that out of the way, let the fun part (even though it's all fun, right?) of this post begin! 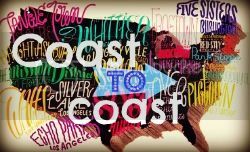 You may or may not be aware that I spend a lot of time reading other runners' and triathletes' blogs. Actually, Mike would say that "a lot" is an understatement of gigantic proportions. What can I say, you all inspire me! Anyway, I "like" some of these blogs on Facebook and I just happened to noticed Jess mention that on 11/11/11 (this Friday) that the Rock 'n' Roll Marathon Series is going to offer a $20 discount on most of their races! Who wouldn't want to join the "Rock Nation"? The problem is that now we have to pick a race. The rest of the 2011 races (except Miami Beach, Florida for some reason) and international races are ineligible for the $20 off discount, so that means our 2012 race schedule is going to have a Rock 'n' Roll Half Marathon on it! Honestly, I would LOVE to do the New Orleans Half Marathon on March 4th, but only because that would be the most AMAZING birthday present to myself ever. I will be on vacation then because of spring break but plane tickets to the "Big Easy" might be kind of expensive. Some other time! Some of the others look enticing but there were two that caught my eye. Mainly because my job allows me to have two months off in the summertime, working at a college has its perks! So which Rock 'n' Roll Half Marathons are we considering? 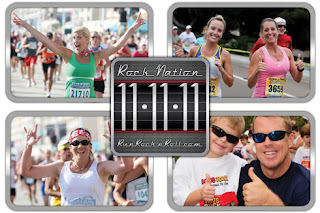 The Rock 'n' Roll Providence Half Marathon on August 19, 2012 is our first contender. This race looks like it would be a lot of fun! I've been to Providence before, but running through it would be completely different. Mike has only driven through Providence so it might be nice for him to see the city up close and personal. The one problem with this race is that we typically go to Maine to visit my family in August and we would probably go there right after this race. That means we would have to figure out what we would want to do with Bernie. This past summer we brought him to Maine with us, so we would most likely do that again this upcoming summer. But, if we ran in the race, it would be difficult for him to come with us. Providence is about 7 hours away, but we would be able to stop at Mike's parents' house along the way. That makes this race seem like a really good option. Yet, when I saw this race I knew it was another contender! Mike and I have both wanted to visit Chicago for a long time! Neither of us have been to Illinois, so it would be fun to venture into new territory. Plus, look at the video. The race course is super flat, even more so than the Providence course! The Rock 'n' Roll Chicago Half Marathon is on July 22, 2012 which is one week before our two year wedding anniversary. Plus, we are planning on running our first marathon on September 30, 2012 and following Hal Higdon's Novice Marathon training program we would have to run a half marathon this exact weekend. How's that for perfect? The drive from Rochester to Chicago is a little bit less than ten hours, which isn't too bad since the drive from Rochester to my parents' house is about ten hours. We would probably make it an extended weekend trip and stop to see some lighthouses in Illinois, Indiana, Michigan and Ohio. After the race, of course. All we have to do now is decide which one we are going to sign up for! Our race calendar for 2012 is going to have some other fun races on it and I can't wait to sign up for them! Have you ever ran in a Rock 'n' Roll Series Marathon or Half Marathon? Are you going to join the "Rock Nation" on 11/11/11? Oh wow. You are awesome! I was thinking about doing the national marathon which just got bought by the rock and roll series. Oh wow, we will all be marathoners in 2012! Well, possibly. I need to work out housing. Thanks for letting me know about the discount. Is there a specific discount code? Rena - I'm not sure I think that when you register on Friday between 11am and 11pm the discount is automatically applied. The National Marathon is the one in March right? So the Half would be $75 and the full would be $90, so not bad! If you do the providence one maybe you could find a pet friendly bed and breakfast and a day care for race day? Sarah - We could do that, we are leaning more toward Chicago right now but I could talk to Mike about that! I would have to look into the doggy day care in Providence to see what they offer, thanks for the suggestion. I'm doing the RnR NOLA marathon on March 4th. I'm super excited for it since New Orleans is one of my favorite cities and I try to go back once a year. The marathon is perfect timing! Good luck at the Stockadeathon...I'll be there too! The weather looks great for Sunday! Kristin - you are so lucky to be doing the NOLA marathon! I really wish we could do the half marathon because that is my birthday, but it would be hard to find plane tickets. Hopefully I'll see you at the Stockade-athon, I'm not sure how it is going to go because of my injury but I'm going to give it my all! Tix are kind of expensive right now...~$350 RT (ugh). It's going to be an expensive trip but at least I have a few months to save! I ran the virginia beach rock n roll Half Marathon last September. It was a great experience!! very well organized, the start went off great and I loved the bands along the way!! I ran New Orleans and it was a *blast*. There was a big conference that my dad happened to be speaking at that weekend, so we hooked the race onto the end of the vacation. I definitely recommend doing the race first, and then staying longer. But even with a little too much fun on Bourbon Street two days before, the weather was perfect and the course was so flat, I scored a 5 minute PR that day. I would love to come back for the full one day.